My research program has so far focused on the effects of exposure to stress during the critical pubertal period of development and its link to depression and anxiety. Data from my laboratory shows that exposure to an immune challenge during puberty induces depression-like behavior in females and anxiety-like behavior in males in an enduring manner. Given that most adult cases of depression and anxiety in humans onset during puberty (average age of onset: 14 years), our animal model offers lots of potential to understand the pubertal vulnerability to the onset of stress-related mental disorders and the role that certain environmental factors may play in precipitating such mental illnesses. When attempting to investigate the mechanisms that link pubertal stress to depression and anxiety, we noted a significant change in gut microbial composition. I am extremely interested in the gut-brain axis, and in the notion that bacteria in the gut can alter brain functioning and impact mental health. This is a new, but highly promising line of research. 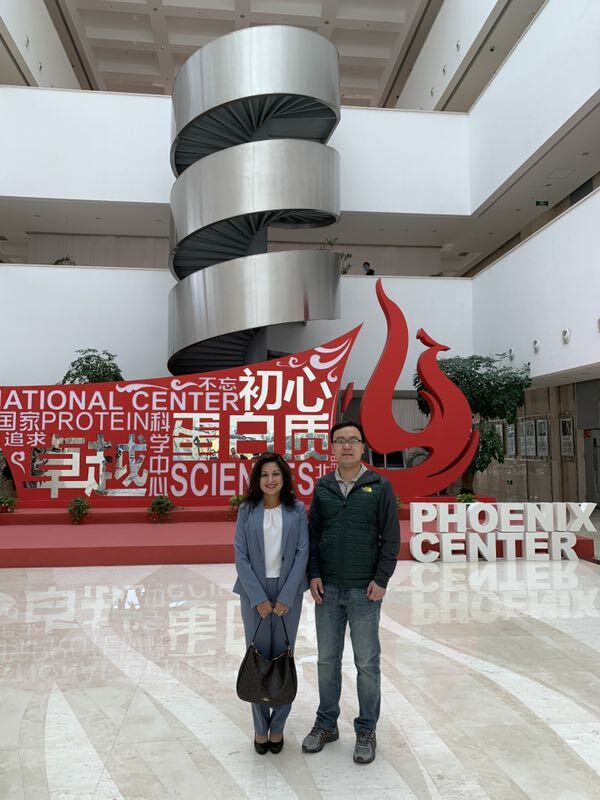 Participating in this exchange program was extremely beneficial to me as it allowed me to meet well-known researchers (Dr. Liping Zhao – Shanghai Jiao Tong University and Dr. Jin Feng – Chinese Academy of Sciences) studying the gut-brain axis and its role in mental health. We discussed collaborations and new project ideas that will really help expand my research program. I also got to visit their laboratories, give talks, share my work with other researchers, and meet graduate students and post-doctoral fellows. The economic burden of mental illness in Canada is estimated to be around $51 billion per year. Even with these investments, mental health care in Ontario is under-funded by about $1.5 billion. In China, the economic burden associated to depression amounts to $7.8 billion USD every year. With these figures, it is imperative that researchers in Ontario and China join forces in identifying novel mechanisms involved in the onset of depression. The meetings with my host researchers addressed these exact issues. We have each, in our respective laboratories, identified certain species of bacteria in the gut that seem to be involved in the onset of depression and in the maintenance of symptoms of depression. Interestingly, analyses of bacterial profile show that we have each identified very similar probiotic bacteria. Therefore, we will now work together to further our projects and run our studies more efficiently and at a reduced cost to make rapid progress and bring our findings to clinical research. The findings from these collaborations will significantly reduce the rates of depression in the population and will be beneficial to the probiotic industries in Ontario and in China, as it will guide them to develop effective products that can be used for medical purposes. I had the opportunity of visiting state-of-the-art laboratories in both Shanghai and Beijing. Each of these laboratories housed expensive and high quality equipment that is only found in certain core laboratories across Canada, which limits access and slow down progress. Through our collaborations, my laboratory will now have access to this equipment and this will greatly facilitate and accelerate our bacterial analyses. One of the centers that I visited, the Phoenix Center, also has a large team of biostatisticians that are willing to help us analyze our gut microbiome data in more details and link it to our behavioral outcomes. I am extremely excited and grateful of these opportunities! The Ontario-China Young Scientist Exchange Program has lead the start of long-term collaborations between my laboratory and those of Drs. Zhao and Feng. The hospitality of my hosts and members of their laboratories was exemplary! We have already begun steps to start the clinical research in Canada that we planned during my time in China. The work that we want to carry out requires a large team of committed researchers. Combining our research efforts allows us to share our expertise and to create the necessary team of committed researchers. In addition, Dr. Zhao will be visiting my laboratory at the University of Ottawa on November 26th and Dr. Feng will likely be coming to my laboratory as a Visiting Professor next April. So, our discussions and exchanges will continue virtually and in person.